The importance of Nguni cattle in the lives of the Zulu people now and then. All our Zulucow products are sustainably sourced from the indigenous Nguni cows of KwaZulu Natal, South Africa. 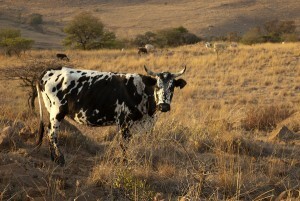 Nguni cattle have played a significant role in South Africa’s cultural heritage. They have an economic, social, political and spiritual importance to the Zulu people, both past and present. The cattle breed is indigenous to southern Africa ie. South Africa, Swaziland, Namibia, Zimbabwe, Botswana and Angola. The ancestors of today’s Nguni cattle were brought by the Xhosa, Zulu and Swazi people, during their migration to Southern Africa, from East Africa, between 600 and 1400 AD. Since then, the Nguni have played an important social and economic role in the development of these societies, especially those of the Zulu people. A village or individual’s wealth and importance is and was reflected by the number of cattle they owned. Nguni cattle are also important for a bride’s lobolo (dowry – the exchange of cattle for wives.) Ngunis are known for their fertility and resistance to diseases. Nguni cattle are also characterised by their unique multicoloured hides which come in a variety of different patterns. Zulus have traditionally and still to this day, breed Ngunis for their attractive colouring and these beautiful markings. Indeed, King Shaka of the Zulus (reign: 1816-1828) bred specific colour patterns in his Nguni herds in order to produce skins for the many regiments of his army. His elite personal guard was recognised by the pure white cowhides they wore, from the Nguni royal herd, ‘the inyonikayiphumuli’ Whereas the more common black and white Nguni cowhides were worn by a lesser Zulu warrior. This would help in battle, to identify who was in command, in the confusion of fighting. King Shaka Zulu understood the cultural and economic importance of the Nguni cattle and when forming his powerful Zulu empire in 1818, he seized control of the Nguni herds of his dominions. His famously bellicose Zulus bred Nguni cattle hide markings specifically for their shields which were vital in battles. 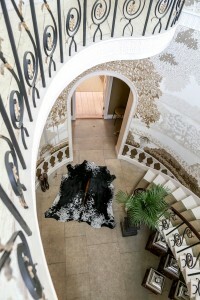 They bred symmetrical patterns into the Nguni hides for this very purpose. Today ‘Zulucow’ celebrates the many beautifully patterned Nguni hides in its hand crafted, unique and natural products.